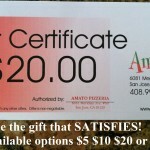 Amato Pizzeria | Amato Pizzeria-Nominated for Best Pizzeria of the South Bay. We would like to thank you and the rest of the Community. Amato Pizzeria-Nominated for Best Pizzeria of the South Bay. We would like to thank you and the rest of the Community.